The place: A bustling auditorium on the ground floor of the downtown library, where open seats are quickly becoming scarce. The time: About half past six pm. The air: Dry but not particularly cool, with the strong aroma of coffee lingering in the windowless space. The crowd: A group of working class adults, mostly later middle aged but not yet elderly, with a couple of techno-philes sprinkled in, and a couple of pungent undergrads waiting in line for the free starbucks coffee and animal crackers. 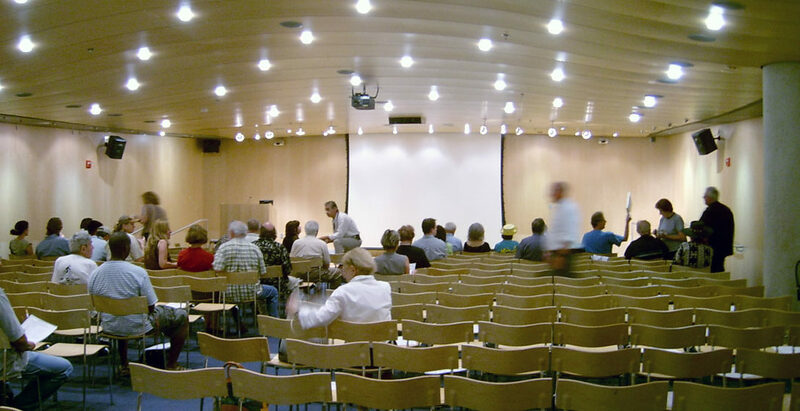 The auditorium: Decorated in a contemporary style with recessed lighting, a natural wood toned ceiling, walls, and chairs, and a thin, institutional blue carpet for contrast. 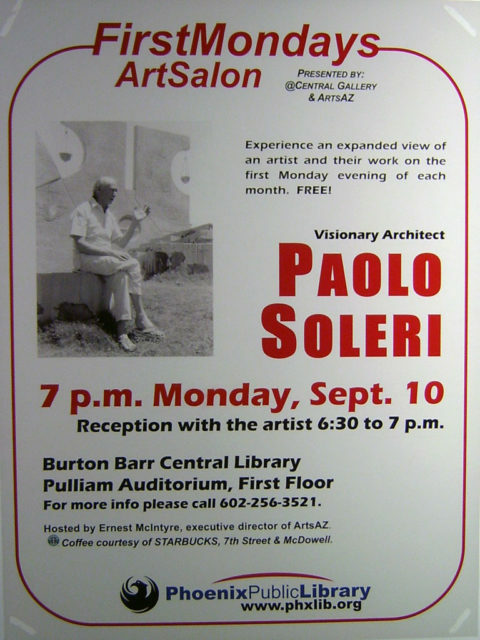 The reason for all these things together on a Monday night: a special presentation from Italian architect and artist Paolo Soleri. Me: Seven rows from the stage, aisle seat, hands folded in my lap, the camera strap dangling from my right pocket, sitting in my chair with anticipation. Ladies and Gentleman, we are ready to begin. Soleri’s sketches of enormous hyper-buildings look as futuristic as anything you have seen before, yet have an aesthetic beauty that is difficult to put into words. There are few hard edges, but plenty of rounded corners, arches, apses, swoops, and half-domes. The ones at Arcosanti were manufactured using a process called “earth building” in which the concrete is poured over a mound of dirt which is removed once it has fully dried and cured. Using the earth for a mold is an interesting and unique way to manufacture cities designed to hold thousands of people on only a few square miles of space. Arcosanti itself is an example of a solution to urban sprawl. One of Soleri’s more interesting works illustrated an “anti-Phoenix” in which land is used efficiently because the city is built upwards instead of outwards. Some other works included a footbridge he designed for the City of Scottsdale, which doubled as a sundial with a unique shadow for each day of the year. The influence of his years as a student of Frank Lloyd Wright are apparent in the stone and concrete staircase at Cosanti, although he failed to mention he was kicked out of the Tailesin school in the mid 1940’s. His Linear City plans are intricate and very well developed architecturally. Also featured were plans for a hurricane-proof city structure to implement in New Orleans, where the architecture of the city would be an attraction in itself; and a fantastic concept of a new World Trade Center with a sloped base, allowing for emergency evacuations via external slides (like on a commercial passenger jet). The building itself resembled Souper Salad at Metrocenter Mall (a delightful mid-century design in its own right). Arcosanti is something of a contradiction, having visited it myself just last year. Although its design is of futuristic form and function with multipurpose spaces, greenhouses, and community living, the lack of funds and volunteers has slowed construction to a pace that’s barely faster than decay. About sixty miles south of Mayer is the sprawling megalopolis that is Phoenix, where residents live in high-rises and planned gated communities, enjoy high speed and wireless internet, 24-hour big box superstores and convenience stores, drive-thru restaurants, pharmacies, and liquor stores, and an endless desire for natural resources, entertainment, and materialism. Due to Arcosanti’s remote location, you may have to wait up to ten minutes to purchase anything at the gift shop with your credit card since the only phone line might be in use by the Subway in nearby Cordes Junction. Sadly, Arcosanti is lacking in terms of technology and convenience compared to the city it aspires to improve upon. 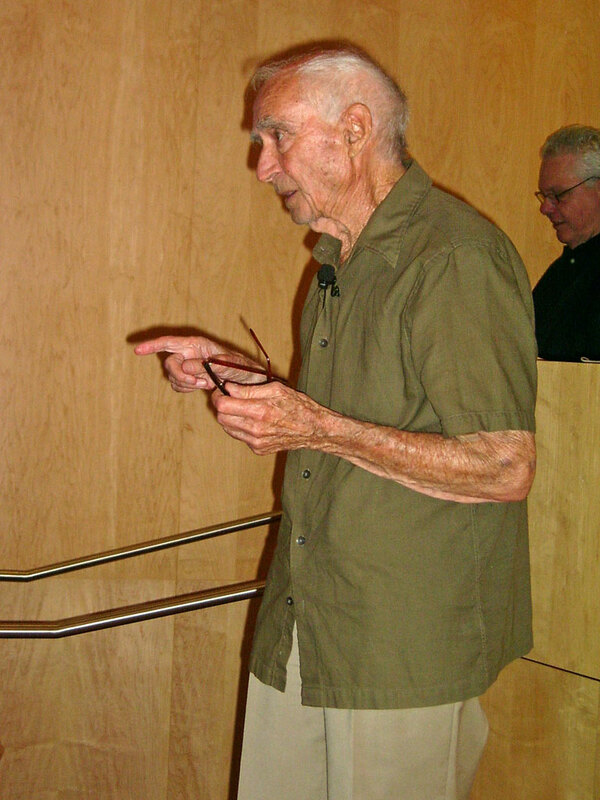 Paolo Soleri speaking at a lecture in Phoenix on September 10, 2007. With these things in mind, I decided to attend the presentation at the library. Paolo Soleri entered the room about twenty minutes before seven o’clock. His frail appearance and softspoken demeanor should not discredit him from the depth of his theologies. Upon his entrance, I introduced myself and shook his warm, smooth hand. The room was now quite full of people, perhaps sixty to eighty were in attendance. When the lights dimmed, a hush fell upon the audience. Paolo approached the podium to thunderous applause. He began to speak, and at first it was quite difficult to understand his accent. One had to focus rather intently on his words as he zipped through a PowerPoint presentation of sketches and photographs to illustrate his ideas. Although the presentation went rather well, the open questions from the audience soured my experience considerably. The first fellow spoke boldly and clearly, and asked what we must do in order to get the rest of society to take sustainable living seriously. “Are demonstrations needed, boycotts…?” he inquired. Soleri stated simply that it is already too late to change the course of things. The next speaker was a feeble looking elderly woman, who barely whispered into the microphone. She commented that some very significant structures in the world, such as Stonehenge and the Pyramids of Egypt were built on top of areas of natual magnetic activity, like the vortexes in Sedona. Paolo’s aide replied, “Are you asking if Paolo has found a vortex at the corner of Scottsdale Road and Camelback?” to lighthearted chuckles. The woman was persistent. “I know of a website run by many learned persons relating to time travel if anyone is interested.” she said. Paolo, with his sense of humor, went on to explain that he had in fact talked to a man a billion years in the future. “I asked him if he liked spaghetti. He said yes.” Paolo joked, to much laughter and grins. Unaware of her apparent craziness, the woman blurted out “The ancient Egyptians weren’t trying to travel through space, they wanted to go to Michigan to…” as the microphone was passed on to another guest with a question. I suppose she might have tried to tell us she could spin lead into gold next! The next man with a question asked what kind of government could be put into place to run something such as his Linear City concept. “As an architect, I am not qualified to answer that” Mr. Soleri replied. That’s when it hit me: these people must be more into it than I realized. Dedicated Solerians, they were hanging on his words and looking to him for advice, as if he were some kind of demi-god. His words about idolatry had apparently fallen on deaf ears. The peole in that little room at the library are eager for a “green revolution” and they were trying to pin down this humble Italian architect something of a leader. His refusal to be made a revolutionary leader is, in my opinion, a rather good idea for someone who is nearing the end of a decorated career in architecture. I guess I had been expecting a technical presentation on the subject of the engineering involved in regoranizing cities into vertical hyperstructures and the like, but wound up in a room full of weirdos who were too eager to discuss the philosophy of green design and what we can do to jump-start the revolution. Conclusion: Paolo Soleri is a talented designer whose ideas for sustainable living were ahead of their time in the 1970’s and continue to be ahead of their time today. However, the arcology concepts shown only apply to large cities of thousands of people and not the homes of individuals, and their adoption by mainstream society is sadly not even a speck on the distant horizon.